Weekend recap: unbelievably beautiful weather, a so-so morning of garage sale hunting saturday (more on that later over at t.c. ), teenage battle of the bands in the park (funk? still? ), few stops at the playground, but the main event was trying to keep 80 stems of spray roses alive in my kitchen turned florist shop from friday morning until the sunday afternoon baby shower. I ordered the flowers online and it worked out so well. I put them in buckets, mixed them up a special nectar, turned off all the lights and cranked up the a/c and they complied by holding the line all weekend and then opening up just in time for the shower. Sadly we were so rushed to set up this is the only decent photo I shot. For the tables I bought paper placemats (orange) and paper tablecloths (pink and cream) at the party store and set down the cream tablecloths with the pink ones folded up into runners and centered over the placemats which I laid out first to create a sort of scalloped edge. Here’s a pic I took this morning in the kitchen showing the vase/tin better and the ‘thank heaven for little girls’ garland. And thank heaven for Tim, my expert in house cutter who meticulously cut out all these circles! The garland is our homemade pink version of this. * Note on the tins, I bought these reproduction ones on ebay. I saw the idea for tins as vases in Domino magazine. Such a cute idea but test and make sure your tins will hold water. Mine did not I discovered Sunday morning and I had to use ziploc bags as liners. And to answer some questions about the pattern booklet – we’re not doing a waiting list or pre-order. Trust me, there will be plenty! If you’re not signed up on the mailing list already, you can do so here to be notified when they come in. And yes, we ship internationally and they’ll be for sale up in the regular shop. Looks like it’s snail/butterfly/birdie/turtle next. I’d better go check my felt supply! *oh and if anyone wants a “congratulations” and “thank heaven for little girls” garland. they’re up for grabs. The shower decorations are lovely! YAY snail pattern!!!! 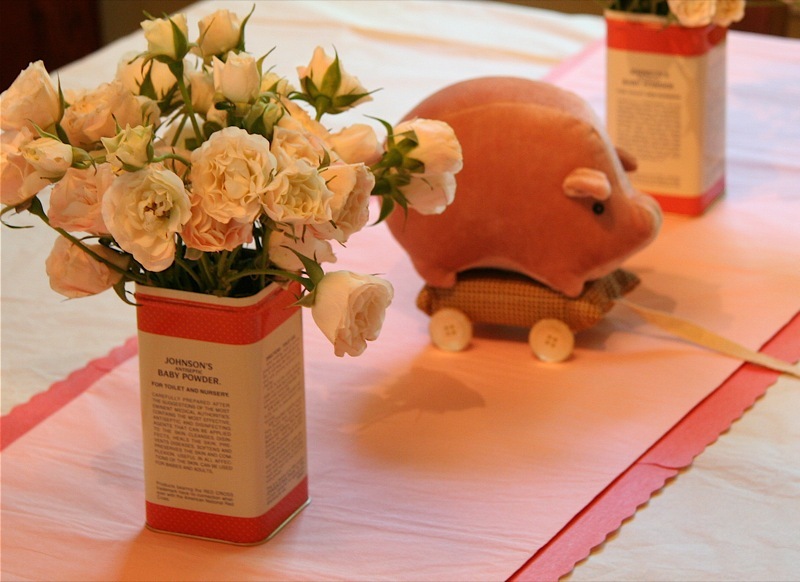 What a great idea for a baby shower decor! And can’t wait for the pattern book to come out. My husband loved the wee bunny that I made for a friend’s baby so much that he wants one too! I guess I’ll have to make a Formula 1 racer bunny for him. Thanks for the pattern! What a lovely idea for a flower arrangement. Those tins are fabulous. I’ve got the old fashioned plaster tin but I didn’t know they had made baby powder. Dare I visit Ebay? What beautiful and creative decorations. I love them! I also wanted to tell you that I received my postcard set in the mail last week and I am so thrilled. They look even better in print than on screen. I am going to frame a few of them for our play room. Thanks so much. You are such an inspiration. Everything was so beautiful – you really outdid yourself. Maggie is very lucky to get you for an Auntie! such lovely decorations! You’ve given me lots of good ideas to file away…. Gorgeous stuff. 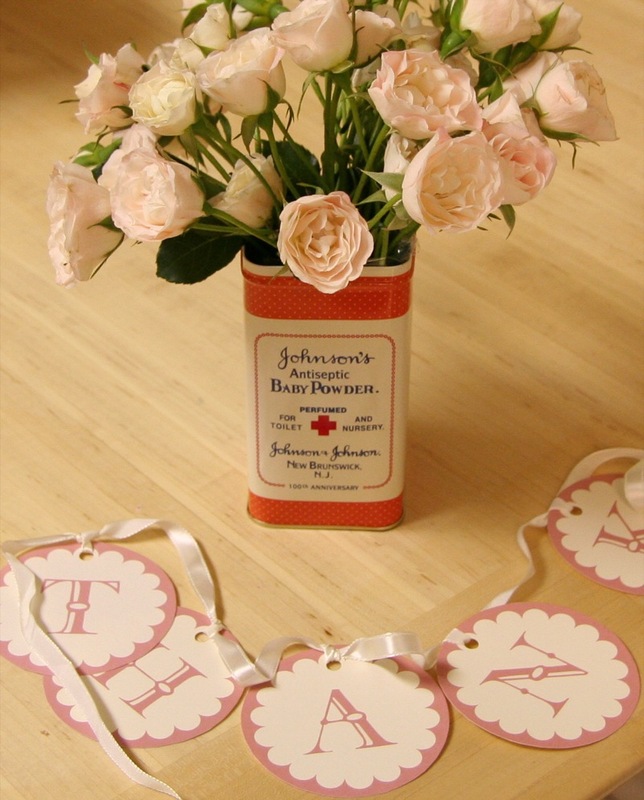 I saw the tins as vases idea in Domino too! Love the way you adapted it for this and good thinking on ziploc bags! Very creative to use buckets as vases. They look very unusual at the pictures. Well done ! Gorgeous table setting. You can be my sister any day. great idea for table settings. i might have to borrow that one for my upcoming showers. Oh dear, I never thought abought tins not being water tight. Hope it wasn’t too much of a disaster! could those tins be any more perfect??!! looks like you did a smashing job with the party–straight from the pages of MS Baby…. How Beautiful And Girly. Id love to order the Thank HEavens Garland. Are you part of the Miniature House group too? How Blessed is your family to have the gift of you to create a hand made Shower. The flowers, garlands and everything look beautiful. I’m sure the party was a great success! Hey, I didn’t know if you had seen these tins– http://www.tea-note.jp/ –I thought of your tins when I saw these today. MS Baby’s got nothing on this shower – adorable decor!